The New Rock & Roll Home Of Sheffield. There’s two ways you can bag yourself a free pizza at Cafe Totem: book a table (for free) for our quiz on Tuesday and receive a free 11" to share with your friends! Additionally, you can subscribe to our mailing list here for your chance to win a meal for 2! Think you're a music whiz? Come and take the Totem Quiz! 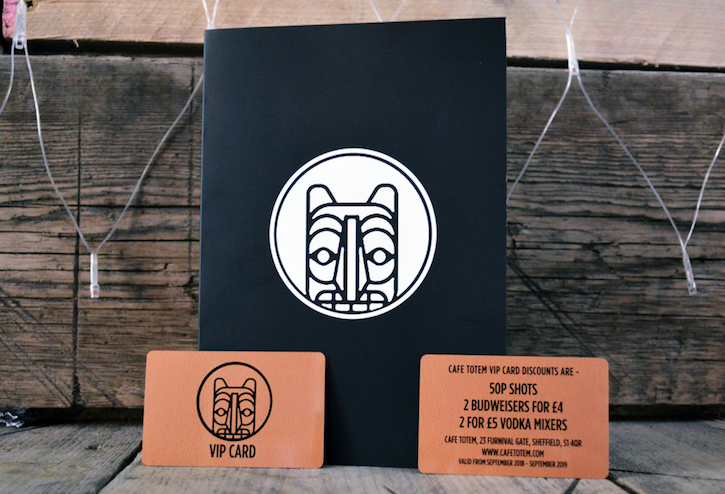 From September 1st we'll be launching our brand new VIP cards, which will be available to purchase behind the bar. The cards will give our VIPs exclusive drinks deals, including shots for just 50p. As well as cheap shots, drinks deals will include two bottles of Budweiser for £4, and two vodka mixers for a fiver. Current discounts at the bar include a popular two cans for five pounds offer. The VIP cards start from Saturday 1st September – whether you're wanting somewhere to work other than the library, or get two shots in for a quid, Totem will serve a range of purposes come the new uni year.